Chicago Calumet High School "Indians"
Today, numerous railroads and highways of interstate, US, state, and local designations bring people together in the city on a daily basis, as does air traffic at O'Hare and Midway Airports. Chicago is a melting pot of people from many nationalities, making it ethnically diverse, and thus, is referred to as "the cultural, economic, and financial capital of the Midwest" (according to Wikipedia). 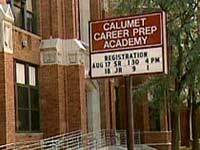 Calumet High School was located at 8131 South May, about nine miles south of downtown Chicago, in the Auburn Gresham neighborhood. The building at this location was opened in 1926. The school opened in 1900 and served the community, before it was closed in 2006 to make way for Perspectives Charter School, which was part of the city's Renaissance 2010 program in reforming and revitalizing education in Chicago. 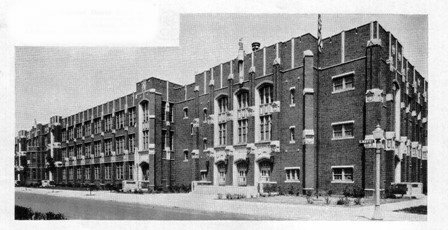 William Doornbos tells us that Calumet High School originally opened in 1889 as Calumet Township High School before becoming a Chicago public school in 1891. Calumet’s going to win that game! Go team go! C! A! L! U! M! E! T! From research we did on the IHSA website (www.ihsa.org), Calumet offered interscholastIc athletics in track, cross-country, wrestling, basketball, baseball, football, and tennis for the boys, while only results in girls' track and basketball were available. In addition, the school also had a rifle team at one time. Historian Robert Pruter tells us that the school was a member of the Cook County League from 1900 to 1913, then was a charter member of the Chicago Public League in 1913. Is it possible that other sports were offered at Calumet for both genders? We would like to hear more for those who were close to the school while it was open. This is a sport where the Indians shone brillantly. Three individual titles were won by Calumet, two of which were by miler Steve Murphy to back up his cross-country feats (see below). As a team, Calumet finished in the top ten of the state on three occasions, including the 1978AA meet with a seventh place showing. The Calumet girls matched the efforts of the boys and showed the rest of the area why they were tops in the state during the mid-late 1970's, taking home a state title as well as a second and tenth as a team, while winning four relay and one individual championship. Tied for 2nd in State! Calumet had a hill-and-dale team during the fall of the school year, with one individual state title coming from Steve Murphy in 1950 to help suppliment his two track championships in the one-mile run, and two teams qualified for the state finals during the 1980's. "Coached by Ted Zayner, the Indians finished second to Chicago Dunbar in the South-Central Section White division standings. Calumet began its playoff run by defeating Chicago Fenger 13-0 in opening-round action. "In the quarterfinals, Calumet was tied by Chicago Austin 13-13, but earned the right to advance in the playoffs by virtue of an advantage in all three tie-breaking statistical categories. Calumet won its semifinal matchup from Chicago Schurz 13-7 and defeated Chicago Morgan Park 25-19 in the league championship game at Soldier Field on Nov. 24th. Calumet returned to Soldier Field for the Prep Bowl a week later, but lost to Chicago Catholic League champion Chicago Leo 12-0 before an estimated 66,000 fans. "The following year, Calumet won the South-Central section White Division title, then defeated Chicago Tilden 18-0, Chicago Lane Tech 12-6, Chicago Lindblom 26-6 and Chicago Fenger 6-0 before losing in the Prep Bowl to Chicago Mendel Catholic 6-0 on a last-second touchdown pass." In the mid-to-late 1920's, Calumet had three fine singles players that made it the semifinal rounds of the state tournament, bringing home a second, a third, and a fourth place finisher three times within four years. The Indians also won two Public League team titles during that decade. Calumet fielded a boys' cage team with some success in the first half of the 1900's, taking second place in the Public League four times, taking one lightweight title, and also capturing a state district tournament during the 1931-32 season. Win-loss records and coaches' names are missing. We do know for a fact that Calumet did offer this sport to its young ladies as early as the 1900's, taking second in the Cook County League in the winter of 1904-05. The sport was again offered in the 1970's when most schools once again had girls' hoops action. Any information that you may have is greatly appreciated. In terms of showing that they could hit the target with accuracy, Calumet was one of the schools that offered a rifle team during the early 1930's, bringing home the Public League title in 1932-33. Very little is known beyond these facts, and we would be curious to find out more about the sport itself when it was offered. --Paul D. “Tony” Hinkle (class of 1916), became a long-time college basketball coach who eventually was elected to both the Naismith Basketball Hall of Fame and the Helms Basketball Hall of Fame. The fieldhouse at Butler University is named in his honor, and he coached his basketball teams to a record of 560-392 from 1926-1970 with a break for World War II. --Earl Eby—attended first Calumet and later Loyola Academy, and participated in the 1920 Olympic Games, taking second for the USA in the 800 meters, and getting a fourth as a part of the 1600 relay. --Georgie Anne Geyer (class of 1952)— became a world renown journalist and columnist who writes regularly on international affairs. --Tommy Sands —actor and teen idol hitmaker, notably with “Teen-Age Crush” in 1957. --Mike Lind (class of 1958)— was an All-State football player, who went on to play for Notre Dame in college and for San Francisco and Pittsburgh in the pros at fullback. --James Young (class of 1967 or 1968)-- after graduation, attended Illinois Institute of Technology and helped form the band TW4. The band changed its name to Styx after signing to Wooden Nickel Records. Young was a guitarist and songwriter, penning "Miss America" and "Snowblind" as two of the group's bigger hits. He still continues to tour today with a current lineup of Styx. --Chaka Khan (class of 1969)—attended Calumet under the name of Yvette Stevens, but later achieved fame in R&B music first as lead singer of Rufus and then out on her own. --Marsha Warfield (class of 1971)— achieved fame as a standup comedienne and a television actress. --Kirby Puckett (class of 1979) -- even though there are no records of his career as a Calumet Indian, Puckett later went on to play 12 seasons in center field for the Minnesota Twins and was elected into the Baseball Hall of Fame in 2001, batting .318 and helping the franchise win two World Series titles in 1987 & 1991. --Ira Green -- was a long-time baseball coach, is the father of Shawn Green who played with Toronto, Los Angeles, Arizona, and the New York Mets between 1993-2007. "My sister and I graduated from Calumet in 1989. My parents and other relatives (cousins) also, attended Calumet. Both my sister and I were on the Pom-Pom team. In order to try out for the team, each person had to learn the school song and choreography a routine. This is how, I remember the words (see facts section above). If you are in need of photos from alumni, let me know. The class of 1987, 1988 and 1989 meet once a year." "I went to Calumet from 1959 -1962 and I tried out for cheers as a freshman, though I didn't make the squad, I do remember the the cheers I learned and the school song to this day. Calumet! Calumet! Go team go! C - A - L - U - M - E - T! Thanks for letting me give you my input. "Upon review of the football portion concerning Calumet, there is no mention of the Blue-Green Division Championship between Calumet and South Shore High School. Calumet won that contest 56-22 and went to the White Division South. Ted Zaynor was the head coach. I attended Calumet from 1971-75 and I had the honor of being coached by Coach Zaynor and later by Coach Johnnie Butler."